If comprehensive analysis of relevant individual statistics from the 1939 NCAA season, itself, is not enough to make a complete mockery of KENNY WASHINGTON’s failure to secure Consensus First Team All-America status as a senior then, surely, a review of the performance from the UCLA star left halfback against the defending National Football League champion Green Bay Packers at the memorable 1940 College All-Star Game certainly would validate Washington’s worthiness of such honors. Passed over for First Team All-America status as a senior in 1939 by thirteen of the fifteen major accredited organizations studied by this blog and ignored entirely by all ten professional clubs at the 1940 National Football League Draft, it was at training camp for the 1940 College All-Star Game in Chicago where UCLA Bruins star left halfback KENNY WASHINGTON would have his invaluable chance to show countless All-America voters (not to mention the prejudiced NFL owners) how foolish their respective choices had been. After being elected in the formentioned nationwide vote of fans, University of Iowa head coach Dr. Eddie Anderson gathered his enormous squad at Northwestern University on August 11th and immediately set about the difficult task of dividing this group of elite collegians into separate units for the first, second, third teams, etc. Anderson calculated that he might need to use as many as four different teams against the defending NFL champion Green Bay Packers in order to keep his troops fresh throughout the 1940 College All-Star Game. Still, with more than thirty backfield players on the roster, it was assured that at least a baker’s dozen “big name” backfield players would not be seeing any action at all. From the outset, however, it was obvious that Bruins standout would not be one of those unfortunate players who would be watching the 1940 College All-Star Game from the bench. Indeed, the headline of an article in The Chicago Tribune on August 12th read, “Anderson Sends All-Stars Through Opening Practice – Mates Praise Washington”. Two days later, the same Windy City newspaper that was the sponsor of the annual College All-Star Game at Soldier Field highlighted the 195-pounder’s passing ability by reporting that “sideline observers express amazement at the passing exhibitions turned in by Kenny Washington, the celebrated UCLA halfback”. Anderson, who had seen Washington play in person during the 1938 NCAA season when his Iowa Hawkeyes lost 27-3 to the UCLA Bruins in Los Angeles, made no secret of the fact that he would be use the four most qualified players in the backfield even if that meant that certain players would not be stationed at their ‘normal’ position. Of course, the primary ball-handler in Anderson’s traditional Single Wing offense would be the left halfback but the Iowa mentor was prepared to sacrifice power in favor of speed at the fullback position. The role of the quarterback, as was customary during the pre-World War II era, remained that of a lead blocker and pass receiver. College All-Stars head coach Dr. Eddie Anderson from the University of Iowa talks things over with the starting backfield as determined by a nationwide vote involving millions of fans — Purdue right halfback Lou Brock (# 40), Notre Dame fullback Joe Thesing (# 33), Iowa left halfback Nile Kinnick (# 1) and USC quarterback Ambrose Schindler (# 24). On August 21st, eight days prior to the seventh annual College All-Star Game, The Chicago Tribune reported that Anderson had tentatively named a first and second team for the upcoming clash with the Packers. 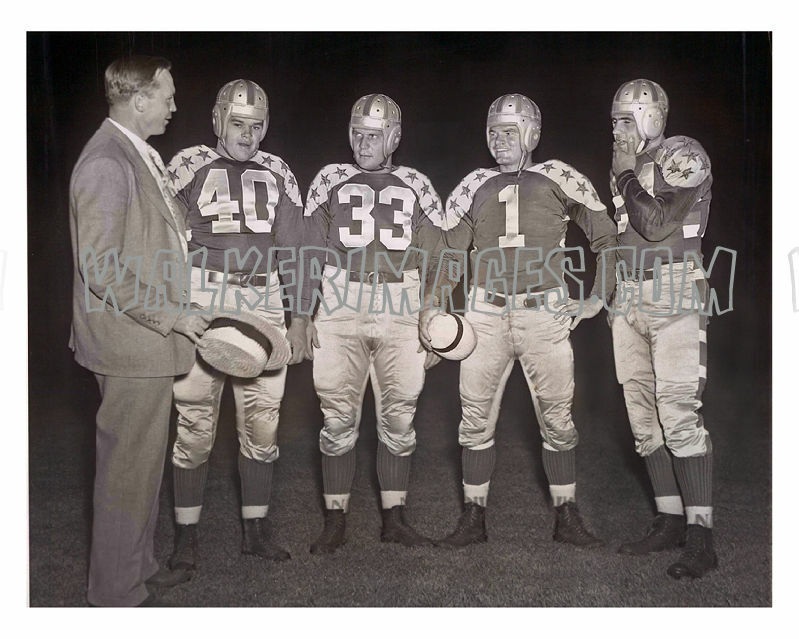 Making good on his word, Anderson’s first string line-up included no fewer than three left halfbacks : Nile Kinnick of Iowa, Hal van Every of Minnesota and UCLA’s Washington. The nation’s total offense leader in 1939 (Washington) retained his accustomed place at the all-important left halfback position but the 1939 Heisman Trophy winner & Consensus First Team All-America (Kinnick) was shifted to right halfback and the Green Bay Packers’ first round selection at the 1940 NFL Draft who had led the entire NCAA in 1939 with nine pass interceptions (van Every) was moved to fullback; beefy Frank Emmons of Oregon, the 215-pound converted fullback who had been the fifth round pick (# 32 overall) of the Philadelphia Eagles at the 1940 NFL Draft, was penciled in at the quarterback position. In addition to this quartet, three backfield players were named as reserves for the first team unit. USC Trojans second-string quarterback Ambrose Schindler, the two-time Second Team All-Pacific Coast selection who had been the Most Valuable Player of the 1940 Rose Bowl Game, was being deployed in training camp at both right halfback as well as at fullback while Clemson Tigers star Banks McFadden, the lanky right halfback who had been selected First Team All-America by three major accredited organizations including the Associated Press and taken fifth overall in the first round of the 1940 NFL Draft by the Brooklyn Dodgers, was working exclusively at fullback. Left halfback Bob Kellogg of Tulane, the First Team All-Southeastern Conference choice who had led the Green Wave to a regular season record of 8-0-1 and a Sugar Bowl berth as a senior in 1939, was asked by the College All-Stars coaching staff to learn the assignments of every backfield position save the quarterback slot. Anderson’s so-called second team line-up consisted of five more backfield players featuring Texas Mines quarterback Ken Heineman, the Second Team Little All-America selection of the Associated Press in 1939 who had been tabbed in the sixth round (# 45 overall) of the 1940 NFL Draft by the Cleveland Rams. The undersized Heineman (5’9″ 168 lbs) impressed during training camp with his passing skills at left halfback while Notre Dame’s speedy left halfback Benny Sheridan was seen as a legitimate threat to run reverses over at right halfback. Also listed with the second unit were the pair of ninth round NFL draft picks : fullback Dom Principe of Fordham, the New York Giants prospect who had been named Third Team All-America by no fewer than four major accredited organizations in 1939, and rugged USC Trojans right halfback Bob Hoffman, the soon-to-be Washington Redskins rookie who had been named Second Team All-America by the New York Sun newspaper and was known to be a fearsome tackler at linebacker.